For 130 years now, Le Jacquard Français has benefitted from exceptional French expertise. 130 years passing down a craft that demands technical skill, self-mastery, and meticulousness, with each new generation sharing the same passion. 130 years of engineers, technicians, and weavers continuously devising new weaving processes (double-faced honeycomb, double weave) to bring you new products better suited to everyday use and current trends. These petites mains, the heart and soul of our company, have earned our brand its international for its quality, refinement, and colors. These same clever hands allow us to continue manufacturing, in France, high-quality linens for ever-changing interiors. These hands are our family, and we could not resist the opportunity of our 130th anniversary to introduce them to you. These 11 portraits feature 11 trades that illustrate our entire production chain and expertise. 11 unique men and women add their own personal flair to their work every day. 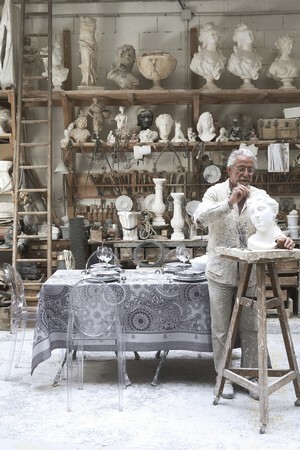 Our artisans posed under the discerning eye of Baudouin, a photographer recognized for his offbeat portraits. The results give a glimpse of their working environment and, more importantly, of the whimsy they share with our brand. To read more about their stories and backgrounds, click below. To celebrate this anniversary, we wanted to rerelease a design that could stand alone to represent all the sumptuous splendor and technical wizardry of jacquard. Looking through the archives of our past designs, we uncovered a real gem: Porcelaine. Straight from the imagination of renowned stylist Primrose Bordier, Porcelaine boasts astonishingly rich patterns and detail in an exceptional model composed as a silk square. The pattern is worked like a painting: its frame, suggestive of carved wood, carefully encloses an intertwining pattern of porcelain cups and plates. The contrasts in the two-color pattern imitate the work of porcelain makers, the exuberant patterns, fine lines and leaves painted on with a brush. Tableware in its purest expression is celebrated here, reflecting an area of exceptional French expertise. Available in a kaolin version for a more modern look or in Primrose Bordier’s beloved China blue, Porcelaine returns to center stage to showcase the genius of a jacquard weave at once meticulous and luxurious.